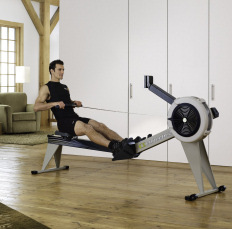 Fly wheel design minimizes noise and maximizes smooth feel of rowing on water Adjustable monitor arm for compact storage Flex foot footrests adjust for quick and easy sizing. 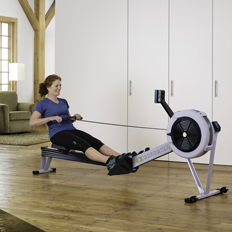 The Performance Monitor is what sets Concept2 Indoor Rowers apart from other training devices, and every Model D includes their most advanced monitor, the PM5. Sophisticated yet easy to use, the PM5 provides accurate, comparable data for every row. A backlight increases visibility, compatibility with USB flash drives makes storing your workout data a breeze, and you can wirelessly monitor your heart rate. The adjustable monitor arm on the Model D lets you position the monitor where you prefer.